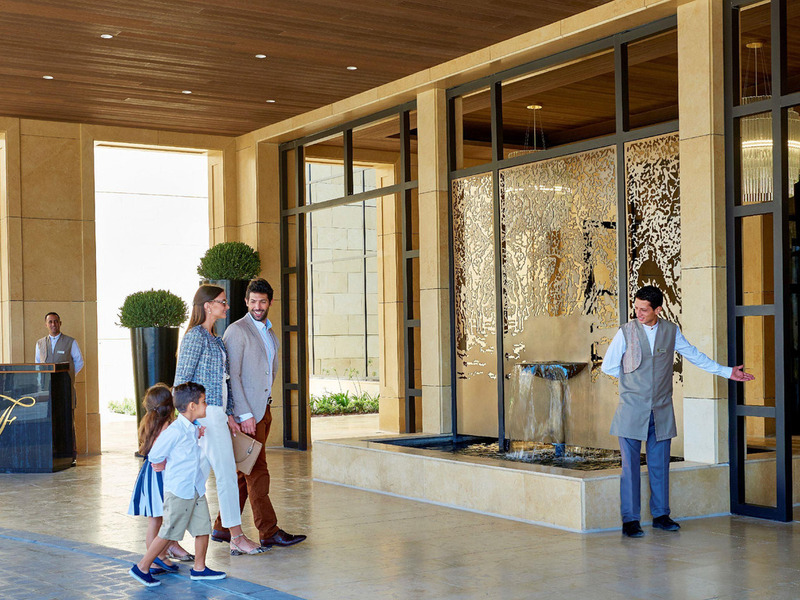 Fairmont Amman is a five star luxury hotel with a prestigious address in Amman, Jordan; centrally located within the city's best neighborhoods and business center. Fairmont Amman stands out with 317 spacious hotel rooms and suites, Fairmont Gold, six exceptional venues, Willow Stream Spa, the city's only day-light ballroom and nine meeting rooms. Amman fuses historical traditions with contemporary city life. From ancient Roman ruins, to cobbled streets with the hip cafes and bars and expansive malls. Fairmont Amman is a five-star luxury hotel with a prestigious address in the 5th circle of Amman. Amman's today fuses historical traditions with contemporary city life. From ancient Roman ruins, to cobbled streets with the hip cafes and bars and expansive malls, the city has a plethora of entertainment venues and a selection of cuisine to choose from. Our pillow menu features unique types of pillows for a perfect night's sleep. Spacious rooms and suites with breathtaking views of the stunning hills of Amman. Exceptional dining experiences from authentic Jordanian to true Japanese flavors. Featuring a range of room categories and residences for all your needs, you will be surrounded by contemporary amenities, plush bedding, elegant bathrooms and spacious luxury to put you at your best for discovering Amman. Choose from Fairmont Room, Deluxe Room, 1 Bedroom or 2 Bedroom Suite. Our specialty suites are Signature Suite, Amman Suite, and the Fairmont Penthouse Suite. For long term guests, we have Fairmont Residences, including 1 or 2 bedrooms, and executive. Salt is where the finest cuts of prime steaks can be enjoyed in a warm sophisticated setting. Salt is an exclusive dining experience to Amman that brings the essence of fine cuts of meat to take this market segment up a notch. Caprice is the place to see and to be seen at night; it is the city's number one night life destination. It is a pulsing haven of arts, great live music, culture, and mixology. Nur is where the in-house guests and the cities elite gather to have the finest and most varied buffet breakfast in the city, characterized by the carefully-executed dishes, an enticing open buffet and interactive cooking stations. Tsuki provides a wonderful array of Japanese dishes that are sure to please any customer. From traditional, casual, to adventure-seeking diners, our exotic menu offers delicious Japanese cuisine that is rich in flavor and artistic in presentation. Nasim is the beating heart for Jordanian cuisine, from the warm aroma of the local spices to the satisfying sweet desserts. Nasim serves the most authentic dishes and is the best place in the city to experience shisha. Crystal is where the Fairmont signature afternoon tea experience comes to life and where the finest coffees and teas can be found alongside a signature selection of wines and champagnes. It is a lounge that reflects the best of London tea culture. CAPRICE is the place to see and to be seen at night; it is the city's number one night life destination that is both elegant and fashionable. It is a pulsing haven of arts, great live music, culture, and with a range of signature cocktails mixology. Very pleased with both the services and accommodations at Fairmont Amman. As mentioned above, the overall experience was very positive. The service provided by the majority of staff was exceptional, particularly from those at the front desk, Nur, Caprice and Crystal. Bahy, at Nur, was especially accommodating and provided outstanding customer service throughout. The accommodations were first class and the amenities superb. My only recommendation is in regards to the service provided in the gold level lounge. While not a poor experience, there are some improvements to be made. More specifically, a greater level of attentiveness from the waitstaff would be appreciated. The hotel is beautiful. And the service we received from all staff was excellent. We spent a bit of time in the executive lounge and the staff there were truly 5 star. Would not hesitate to recommend or stay again. This is the nicest hotel we’ve stayed in. Hospitality was great and accommodations were beyond expectations. I do a lot of international traveling and this hotel was one of the best. The staff and the hotel in general is fantastic. The staff and especially the guest relations staff go out of their way to make you feel at home. From the time you get there to the time you leave they call you by name. I will be back. Wonderful experience...didn't want to leave! Absolutely beautiful property with warm professional service to match. One of my best hotel experiences! The service was superb and the hotel was impressive. The experience was excellent. You bellman reception and restaurants were professional in every way. We have stayed in other Fairmont and the Amman Fairmont was a truly pleasant experience. Very nice hotel, very good service, nice staff. Warm, friendly staff. Beautifully designed room. Nice service in bars and restaurants. Thank you for the exceptional experience, and professionalism. By far the best hotel in Amman. The rooms are big, neat and full with great small detailing. Very convenient for all occasions. Breakfast buffet, Caprice Bar and all other facilities present a very high added value.